Highlighted by fast, firm and wide rolling fairways, a variety of strategically placed bunkers and large greens, the 7,154 yard, par 72 Watson Course, a Signature Design by Tom Watson, is as much about strategy as it is about length. Demanding a well thought out approach from every player regardless of skill level, this course puts a premium on a solid short game with spacious green complexes where club selection can vary from putter to lob wedge to three-wood. 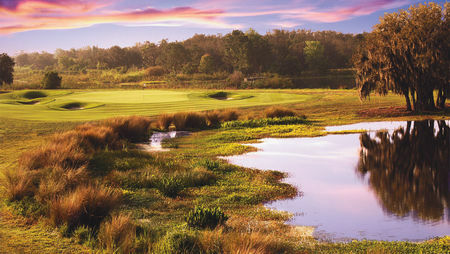 Palmer Course: Another Crown Jewel for the King Salamander’s Reunion Resort, just west of Orlando Florida, is how to three fantastic golf courses by three of the game’s greatest players: Jack Nicklaus, ow Watson and the late, great, King, Arnold Palmer. The Arnold Palmer Course at Reunion Resort plays 6,916 yards from the back tees with a course rating of 70.9 and a slope of 132. Five sets of tees make the Arnold Palmer Course enjoyable for golfers of all skill sets and abilities. The course can be played anywhere from 4800 yards to 6900 yards. Since its opening, the course has received many accolades including #21 on Golf Digest’s list of America’s Top 40 New Courses in 2005, and Golf Magazine’s “The Best Courses Near You”, where it ranked # 24 in 2008 and #27 in 2010. Golfweek Magazine has also bestowed many awards on this Arnold Palmer masterpiece. What makes this course so unique – particularly in this part of the country – is the hilly terrain. You can also find some dramatic (remember this is Florida) elevation changes of up to 50 feet. All of this can make for some interesting risk/reward opportunities. Would Arnie have it any other way? The Palmer course is as beautiful as it is challenging. Expansive waste areas and strategically placed bunkers combine with the natural rolling terrain, mature trees and meticulous landscaping to ensure you have a memorable round. The fairways are, for the most part wide and generous, giving you the opportunity to do what Arnold did for a living: go for broke! The greens feature quite a bit of undulation. Many of them are oversized, some feature multiple tiers, crowns and ridges; very seldom do you find yourself with a straight putt. The practice facilities are second to none with a targeted grass range, putting greens and short game areas for chipping, pitching and bunker practice. The course is serviced by a beautiful clubhouse with an impressively stocked golf shop, restaurant, lounge and outdoor patio. Memorable Holes (All Yardages are from the Gold Tees) Number 4: Par 4, 339 yards. Don’t let the length of this hole fool you, it may be short but it demands two good shots to get it close. The green is rather shallow; it is also very firm and slopes drastically from back to front. Unless you are approaching from the right side, you will need to carry it on to the green. If this is your only par, it’s nothing to be embarrassed about! Number 6: Par 4, 376 yards. The right side of this dogleg right par 4 is full of bunkers as well as a large waste area the farther right you go. A well-placed fairway bunker on the left side collects a lot of balls as well off the tee. A drive played down the right side of the fairway provides the shortest approach shot however club selection on your second shot is critical for a realistic opportunity at birdie. Number 7: Par 4, 274 yards. The ultimate in risk/reward opportunities and the rarest of golf holes! This is truly a short par 4. Many players will be tempted to drive the green; few will succeed! This severely undulating green is almost completely surrounded by deep bunkers; not to mention the intimidating tee shot over water. There is nothing wrong with marking a 4 on your card for this hole! Number 9: Par 5, 526 yards. Longball hitters can get there in two if the hole is playing downwind. The waste area that you have to carry off the tee is present all the way down the right side. The pitch and undulation of the fairway can also make for some awkward lies. The green is large and slopes gently from back to front making for plenty of birdie opportunities. Number 10: Par 5, 581 yards. This par 5 dogleg right hole is pretty much a three-shot hole for any golfer. Try and cut the dogleg and a cluster of well-placed fairway bunkers awaits your shot. Hit whatever club you hit the longest (this may include a driver depending upon your confidence of hitting it “off the deck”) on your second shot to leave a manageable distance for your approach shot. The green has a gentle slope to it and as well guarded by bunkers. Number 15: Par 5, 487 yards. This to me is the most interesting hole on the course. It is - by all accounts thus far on the Arnold Palmer Course – a short par 5. The thing is that unless you can hit a 300-yard drive over water, you can’t really aim at the green. If you can pull that off, getting on in two is pretty much a given. The rest of us will have to determine how much of the hole to cut off, making it a three-shot hole. You will also find huge elevation changes on both your layup and approach shots so be sure to take an extra club. Number 18: Par 4, 382 yards. This is a beautiful and well landscape finishing hole. What you don’t see off the tee can hurt you. From the tee, you can see the well-placed fairway bunkers on either side of the fairway. What you don’t realize is that from there, the fairway dips downhill and incorporates a large waste bunker and large rocks. Very aesthetic and appealing – unless you get behind one! Your approach shot is uphill to a two-tiered green that slopes from back to front. A very scenic hole. Last Word: The Arnold Palmer Course at Reunion Resort is a very exciting and challenging course. While it may be the shortest of the three courses, it still offers a good mix of long and shot holes that will have you hitting every club in your bag. There are several risk/reward opportunities that can make (or break) a good round. Something else you don’t usually experience in these parts of Florida are uphill shots. There are several elevation changes whether it is hitting over a deep depression on a par three hole or trekking uphill to the green on a par 5, it is certainly a welcome change from your typical Florida golf outing. This layout has a number of forced carries off the tee, however it shouldn’t be much of a problem unless you are playing from the back tees. But then, what else would you expect? The course and especially the greens are always in tournament playing conditions. There are not a lot of straight putts on any of the greens on this course so be prepared to take your time and read each putt carefully. There are also a few hidden surprises that cannot be seen of the green in the form of waste and sand bunkers and the rocks on 18. 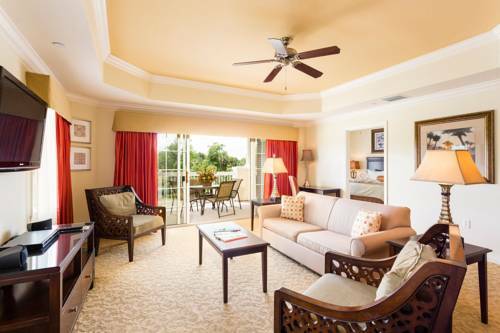 Besides being home to three championship courses designed by three of the most memorable players to ever pick up a club, Reunion Resort is also a family retreat, combining the best of resort amenities with small-town life. 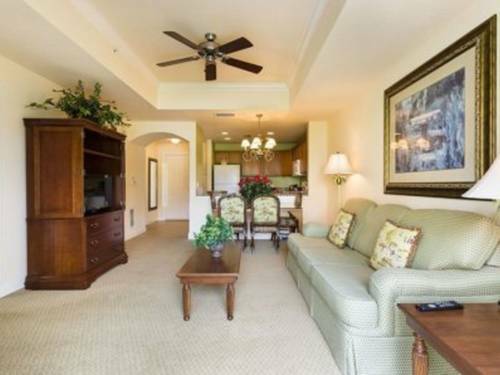 Amenities include horse stables, tennis courts, a state-of-the-art spa and fitness center, a water park a multitude of swimming pools in various locations, miles of biking and hiking trails and, of course shopping. And let’s not forget the world-class dining! 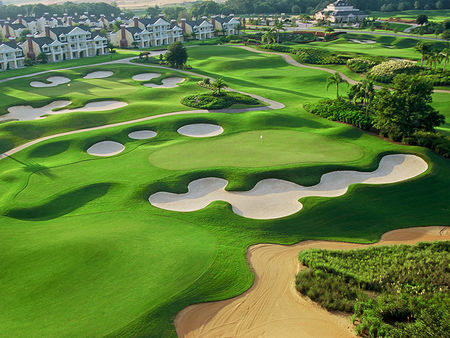 All in all, the Palmer Course at Reunion Resort is a great test for golfers of all playing levels and abilities. Nicklaus (Tradition Course Review - Play the Course That Jack Built Salamander’s Reunion Resort is located west of Orlando off I-4 at exit 58, then about 1 mile east. The rooms in the main tower are not your typical hotel rooms, they’re spacious multi-bedroom condos that can sleep multiple couples. They are beautifully decorated and well appointed. This is the kind of place you could easily call home; and many do. 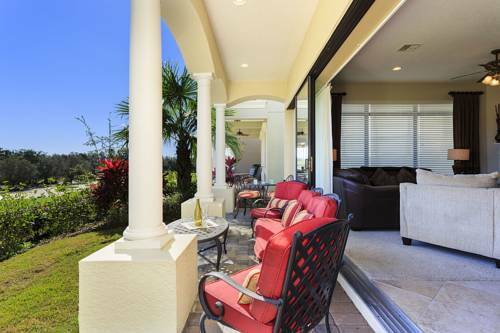 If these accommodations are not your style and you want or need more, Reunion rents a multitude of single family homes; as many as five bedrooms. While on property, you can take advantage of personalized concierge services, world-class dining, and a bevy of other amenities. Some of these amenities including horse stables, tennis courts, a state-of-the-art spa and fitness center, a water park and swimming pools in various locations as well as miles of biking and hiking trails. If this gives you the idea there’s a lot of thing to do here, you’re correct; and we haven't even started talking about golf! Although Reunion is a great family resort, with its huge waterpark and kid-friendly programs, a lot of the guests are here for the golf. Reunion gives golfers three top-notch courses designed by three of the game’s greatest players: Arnold Palmer, Jack Nicklaus and Tom Watson. 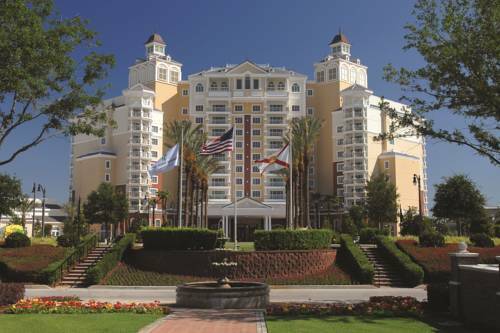 The only way you can take advantage of these courses is to stay at the resort; stay and play packages are available year-round and require a minimum two-night stay. Perfect for three rounds of golf! Formerly known as The Tradition Course, this Jack Nicklaus (and Jack Nicklaus II) Signature course plays 7,219 yards from the back tees with a course rating of 74.8 and a slope of 140. The white tees measure considerably less at 6,205 yards but still carry a rating of 69.8 and a slope of 129. The Nicklaus Course was the last of the three to open and offers four sets of tees, providing a challenge for all golfers. It is also far and away the toughest of the three courses. 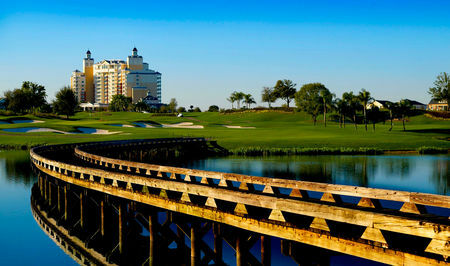 The Nicklaus Course is a parkland-style layout and was named one of Golfweek’s Top 100 Resort Courses in 2009. It also ranked #17 on its Best Courses You Can Play list in 2010. The course follows the natural contour lines of the land in the area; water comes into play on 9 of the eighteen holes - much less than most Florida courses. A wide variety of trees can be found along the way including: oaks, magnolias, maples, and palms. Catching the magnolias in full bloom is an added treat. There is a lot of undulation in the course both in the fairways and especially on the greens. There are more than 100 bunkers on the course, as well as small, postage-stamp greens, and a few forced carries. Tee boxes are beautifully landscaped and well maintained, fairways are meticulously trimmed and groomed, and the greens deserve their own article! Many of them are elevated and surrounded by evil bunkers and waste areas. Because the course was completed during the recession, there has been no clubhouse to speak of. That all changed recently when ground was broken on the new Jack Nicklaus clubhouse, which is set to open in the fall of 2018. In addition, the large house you see being built behind the 18th green is for none other than the man himself. The Nicklaus Course also has its own practice facility which includes an 1,100-ft. driving range with grass tees, a short game area and a practice putting green. The Nicklaus Course is a three-minute drive from the main clubhouse - providing there is no traffic in the roundabout. Most Memorable Hole: Number 18: Par 5, 420 yards. If the tees are up, number 18 offers a great opportunity to finish on a good note; after all it’s just a long par 4. When they are back, and your tee shot needs to carry the marsh area, it can be a real test. Keep right off the tee and avoid the two large waste bunkers. The pot bunker in front of the green will keep many players from going for the green in two. Keep right again on your layup shot, avoiding the pot bunkers that dot the right side and leave yourself a short approach setting up a birdie opportunity and a spectacular finish! Favorite Par 3: Number 16, 177 yards. Make sure you take the right club off the tee; anything short will most likely lead to an undesirable number on the scorecard. Number 16 is the signature hole and features a daring carry over water to a shallow, firm green protected in front and back by deep bunkers. Holding the putting surface off the tee is a challenge if you hit the ball with a low trajectory. Favorite Par 4: Number 2. 402 yards. The conservative play on this demanding par 4 is to aim down the left side of the fairway, between the two fairway bunkers. A more aggressive line down the right side and over the bunkers will leave a much shorter approach shot but runs a higher risk of finding trouble. The forced carry off the tee shouldn’t prove difficult. Club selection is everything as you approach this multi-tiered green; finding the front left bunker is a very tough up and down. Par is a good score here; after all, it’s the number 1 handicapped hole on the course. Favorite Par 5: Number 3, 536 yards. Water rears its ugly head on the layout's first par 5. Avoid the right side at all costs; it is replete with trouble in the form of bunkers, and water. There is plenty of room out to the left. Ideally you want to play your tee shot down the left center of the fairway; for most, this is a three-shot par 5. Again, favor the left side on your layup and leave yourself a short chip shot into a small target green. Three well played shots can lead to a well-deserved birdie opportunity. Last Word The Nicklaus course is not your typical resort course; it's more of a "player's" course. Scoring well here requires a significant amount of accuracy off the tee - anything hit wide left or right will either be irretrievable or in some sort of hazard - most likely a waste bunker. A player who is more of a thinker as opposed to someone who wants to grip it and rip it will prevail out here. There are a lot of bunkers and waste areas along the way; many have been placed strategically in the landing areas which again places an emphasis on accuracy off the tee. I found myself in several of them; I guess that’s how you know you’ve got the right set of tees! The green complexes are what make the Nicklaus Course truly challenging. Most holes have modestly elevated greens although a few are very significant. The way these green complexes are set up and bunkered, a bump-and-run approach shot is not usually an option unless you are skilled at running the ball through a bunker! Most green complexes require you to fly the ball on to the putting surface. Once there, the subtle little undulations of the green take over. Be sure to study all putts carefully, even the tap-ins; there are not a lot of straight putts out here. The course is in great shape year-round and the grounds crew is painstakingly meticulous. Staff is friendly and helpful, especially the starters. If you haven't played the course before, listen to them carefully. They will give you a wealth of information. If you're in the area, you owe it to yourself and your golf game to play the Nicklaus Course at Reunion Resort. After all, it's the perfect destination for a great round of golf on one of three fabulous courses designed by three of golf's greatest players. It's also a great spot for a family vacation. Come to think of it, why not do both?